The roof of your home can account for up to 40 percent of your home’s exterior. 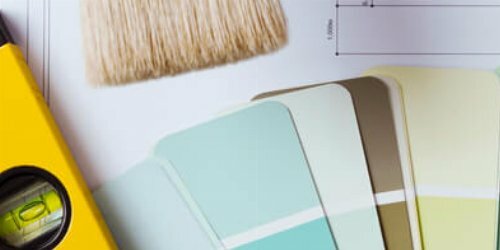 From curb appeal to home safety, it’s important to understand what keeps your home looking sharp and (more importantly) dry. Most homeowners will need to replace a roof at some point, but many don’t know where to start. That’s why we’ve outlined the most common roofing terms and components to be familiar with before starting any roofing project. What Is a Roof Made Of? There are seven basic roofing components you should be familiar with. Shingles: These can be made of a variety of materials, but their main purpose is to protect underlying sheathing from the weather. Shingles are traditionally measured in squares. A square of shingles is 100 square feet, so if you know your roof is 25,000 square feet you will need to order 25 squares. Sheathing: Boards or sheet material that are attached to the rafters that cover your home. This is also referred to as the deck of a roof. Trim: Installed to protect the seam in the roof along a hip or ridge (see more on hips and ridges below). Rafters: These are the wood or metal slats inside your home that support the sheathing and shingles. They’re a bit like the skeleton for your roof. Underlayment: Water-resistant, paper-like material that is laid over plywood sheathing to seal it from damaging elements such as rain and snow. This is used with a membrane and vapor barrier, which is typically a sheet of plastic blocking air and water from permeating through. Flashing: Sheet metal or other material installed on top of the joints of a roof system to prevent water damage. The joints of your roof are anywhere it changes direction, and flashing is used to help seal these points off from the elements. Drainage: The design feature of a roof that allows it to shed water. This is measured using the slope, or pitch, of the roof, which is determined by the rise in inches for each foot of horizontal distance—known as the “run.” For example, a roof with a 5-in-12 slope rises 5 inches for every foot in distance. 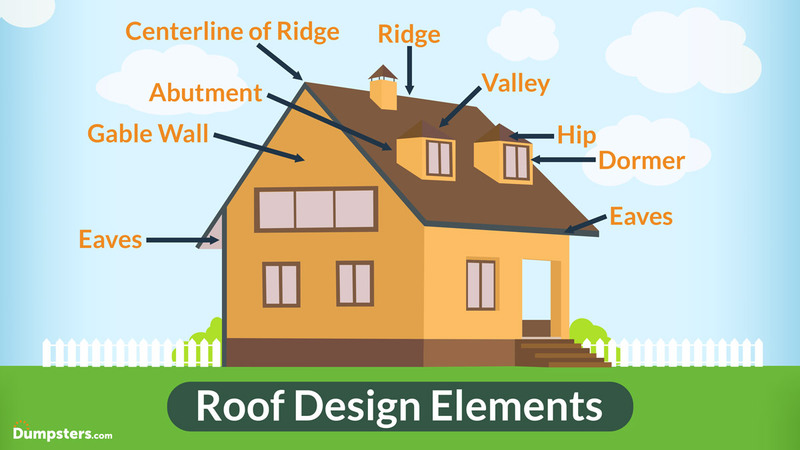 After you understand the components that make up your roof, it’s important to identify roofing design elements, and which ones apply to your home. 1. Gable Wall: These are triangular portions of the home which extend from the eaves to the peak of the roof. 2. Centerline of Ridge: Also called the verge, this refers to the wall or rafter under the edge of a roof where a gable ends. 3. Ridge: This is the highest point of the roof, which is also referred to as the peak. 4. Valley: The areas of the roof where two sections meet and slope down. 5. Eaves: Edges of the roof that hang over the exterior walls of a home. 6. Hip: A high point where two sections of the roof meet. 7. Abutment: Where sections of the roof meet a vertical area such as a wall or chimney. 8. Dormers: Not every roof has them, but these are sections of the home that stick out from the roof, designed to bring in natural light to an attic or third floor. Take a look outside and check which elements your roof has, noting how many ridges, hips, abutments and gables are present. If you’re considering a roof replacement in the near future, it’s important to understand the square footage and design of your existing structure to estimate how much it will cost. Does your home have the original roof, or were repairs made within the past few years? Depending on the type of shingles you have and the age of your roof, you may need to keep an eye out for leaks or even schedule a replacement. When your roof needs to be replaced will depend on the existing structure and shingle type. Asphalt shingles will hold up for 20 years, while wood shake roofs can last up to 30. Proper ventilation is important for a healthy roof system. If your roof lacks air flow it may be susceptible to mold and mildew. In addition to a main vent in your roof, there are a few other factors that affect how air moves through your attic to the roof. A gap-free layer of insulation on the attic floor to protect the house from heat gain and loss. A vapor barrier under the insulation and next to the ceiling to stop moisture from rising into the attic. Enough open, vented spaces to allow air to pass in and out freely. Typically, a roof should have 1 foot of vent space for every 150 square feet of attic space. Calculate how many vents your roof needs here. 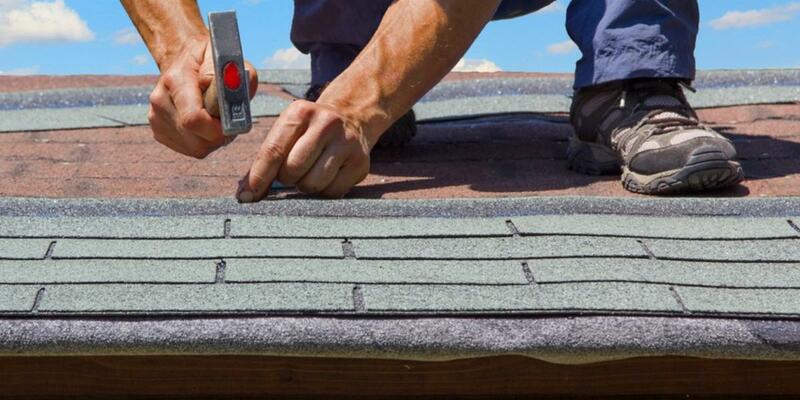 A variety of materials can be used as shingles, from asphalt to wood or even slate. Each one comes with a different warranty, and durability depends on your area. Keep in mind that harsh weather conditions such as high winds or extreme cold can crack clay shingles. Fire rating is a system for classifying the fire resistances of roofing materials. Classes are labeled A, B and C. Class A materials have the highest resistance to fire that originates from outside of the structure, and these include clay tiles, fiberglass asphalt composition shingles and metal roofing. Pitch will determine what type of shingles are best suited for your roof. Low 1 - 3 inches Steel or material that provides a watertight seal. 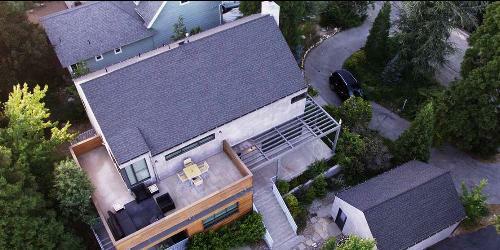 Medium 4 - 12 inches Asphalt and composite shingles. High 5 - 12 inches Wood shake or slate shingles. Understanding the roofing basics gives you a foundation to work from when spotting issues with your current system, and helps you understand what options are available for your roof’s pitch. Ready to start your roofing project? Check out the next post in our roofing series on how to budget for a new roof. Should you stay in your home during a remodel? Use these tips to learn how to live through a home renovation with your routine and sanity intact.